After 35 years of war in Afghanistan1, the year 2014 brings two milestones capable of major impact on the future – for better or worse. Firstly, the presidential elections that took place in early April, so far reported to be relatively successful, and secondly the withdrawal of international combat forces planned for the end of the year. In a conflict which sees strongly opposing positions and negotiations strained by heavy pre-conditions, this essay, following the Harvard Approach2, analyses the conflict parties’ underlying interests for a joint Afghanistan. The analysis is intended to provide an outline for the German Government and the Foreign Office on ways to approach the Taliban in dialogue on the political future of Afghanistan, including questions of political representation and the national security apparatus. Section 2 analyses the current state of the conflict and places the conflict and its parties in the broader historical context. It explains Afghanistan’s lack of strong central government, and why areas beyond Kabul have traditionally been under the authority of local strongmen or tribes, who fought each other unless external threats existed.3 We seek to evaluate whether the Taliban can be constructively involved instead of applying the ‘terrorist’ label.4 Labeling this prominent insurgency group as such pre-emptively excludes such actors rather than seeing them as potential agents of change that can play a constructive role in securing peace.5 Based on these analyses, section 3 drafts an intervention strategy, and looks at possible ways of constructively engaging the conflict parties. Finally, section 4 concludes by offering practical recommendations for the German government. For Afghanistan’s highly complex setting, at its height involving the military of 47 countries, comprehensive analytical tools are required. Bright suggests such tools by combining the ‘Wehr Conflict Mapping Guide’6 and Sandole’s ‘Three Pillar Approach’7. Bright’s ‘Conflict Mapping Chart’8 and its analytical tools aim to create a better understanding of common problems, underlying causes, parties’ positions and interest, and options and alternatives for a resolution based on past experiences and theoretical findings. Following Bright it is important to analyse four types of parties and their relationships and power asymmetries.9 The relationship map (Appendix B) displays the result of a detailed analysis and visualizes parties’ power (relative size of circles), with regards to resources or “power currencies”10. The most important primary conflict parties, the ones directly involved in the conflict11, are President Karzai’s Afghan government and the Taliban, led by Mullah Omar. However, one may not disregard other mujahidin factions, most importantly former Prime Minister Hekmetyar’s Hizb-e-Islami and Sirajuddin Haqqani’s Haqqani network, which is considered closely linked to both al-Qaeda and Pakistan’s military.12 Any intervention giving preference to the Taliban risks strong opposition by other parties.13 Additionally, regional strongmen, so called ‘warlords’, have power to act as spoilers.14 Very different dynamics can be observed with regard to government relationships with the mujahidin factions. While there appears to be direct contact with Hizb-e-Islami leaders and increasingly successful inclusion in political positions15, no direct communication channels exist with the Taliban’s decision-making body, the Quetta Shura. Afghan Ministry of Foreign Affairs. Acting Foreign Minister meets with German Special Representative for Afghanistan and Pakistan. 17 November 2013. http://mfa.gov.af/en/news/minister-afg--2 (accessed December 15, 2013). AFP. Aid groups vow to stay as NATO exits Afghanistan. 29 December 2013. http://au.news.yahoo.com/thewest/world/a/20525517/aid-groups-vow-to-stay-as-nato-exits-afghanistan/ (accessed December 30, 2013). AlJazeera. Further delays for US deal with Afghanistan. 26 November 2013. http://www.aljazeera.com/news/asia/2013/11/further-delays-us-deal-with-afghanistan-201311263545983309.html (accessed November 26, 2013). —. NATO personnel killed in Afghanistan. 27 December 2013. http://www.aljazeera.com/news/southasia/2013/12/nato-personnel-killed-afghanistan-20131227111554324104.html (accessed December 27, 2013). BBC Productions. “Never Ending War In Afghanistan - Documentary.” Youtube. 2011. http://www.youtube.com/watch?v=mdwAN8khPE8 (accessed December 26, 2013). Berdal, M., and D. Keen. “Violence and Economic Agendas in Civil Wars: Some Policy Implications.” Millennium: Journal of International Studies. Vol. 26 (3), 1997: 795-818. Berghof Foundation. “From Combatants to Peacebuilders: A Case for Inclusive, Participatory and Holistic Security Transitions.” Berghof Conflict Research. 2012. http://www.berghof-conflictresearch.org/documents/publications/Policy_Paper_dudouetetal.pdf (accessed December 20, 2013). Bright, L. Shay. “The Conflict Mapping Chart.” n.d. http://www.in-mediation.eu/wp-content/uploads/file/ConflictMapping.pdf (accessed October 31, 2013). Brinkmann, Cornelia. “Steps for Peace: Working Manual for Peace building and Conflict Management.” German Development Service (Deutscher Entwicklungsdienst, DED). December 2006. http://www.giz.de/Entwicklungsdienst/de/downloads/ded2007-steps-for-peace-en.pdf (accessed December 15, 2013). CIA. The World Factbook. 9 December 2013. https://www.cia.gov/library/publications/the-world-factbook/geos/af.html (accessed December 30, 2013). Clark, Kate. “Afghanistan, the United States and the BSA: Who blinks first?” Afghanistan Analysts Network. 27 November 2013. http://www.afghanistan-analysts.org/afghanistan-the-united-states-and-the-bsa-who-blinks-first (accessed December 12, 2013). —. “The Opening of the Taleban Office in Qatar: A propaganda coup and an angry government.” Afghanistan Analysts Network. 13 June 2013. http://www.afghanistan-analysts.org/the-opening-of-the-taleban-office-in-qatar-a-propaganda-coup-and-an-angry-government (accessed November 28, 2013). —. “The Taleban in Qatar (2): Biographies – core and constellation.” Afghanistan Analysts Network. 24 June 2013. http://www.afghanistan-analysts.org/the-taleban-in-qatar-2-biographies-core-and-constellation-amended-with-more-details (accessed September 29, 2013). Der Spiegel. Afghanistan-Beauftragter: Botschafter Koch ersetzt Steiner. 10 February 2012. http://www.spiegel.de/politik/deutschland/afghanistan-beauftragter-botschafter-koch-ersetzt-steiner-a-814487.html (accessed December 15, 2013). —. Weltsicherheitsrat: Uno streicht 14 Taliban von Sanktionsliste. 16 July 2011. http://www.spiegel.de/politik/ausland/weltsicherheitsrat-uno-streicht-14-taliban-von-sanktionsliste-a-774857.html (accessed December 14, 2013). Deutsche Welle. UN proposes removing Taliban from terror list to promote dialogue. 17 June 2011. http://www.dw.de/un-proposes-removing-taliban-from-terror-list-to-promote-dialogue/a-6550683-1 (accessed December 6, 2013). Donohue, William A., and Paul J. Taylor. “Testing the Role Effect in Terrorist Negotiations.” International Negotiation 8, 2003: 527-547. Dougherty, J.E., and R.L. Jr Pfaltzgraff. Contending Theories of International Relations: A Comprehensive Survey. 4th ed. New York: Longman, 1997. Eban, Abba. “The Duty to Negotiate.” Washington Post, September 9 , 1994: op-ed page. Economist Intelligence Unit. “Country Report: Afghanistan.” Country Reports January 2003, August 2003: 1-21. —. “Country Report: Afghanistan.” Country Reports January 2012, January 2012: 1-24. Fisher, Roger, and William Ury. Getting to Yes: Negotiating Agreement Without Giving In. 2nd ed. Edited by Bruce Patton. Boston, MA: Houghton Mifflin Hartcourt, 1992. Grono, Nick. “Afghanistan's Injustice System.” Foreign Policy. 23 February 2012. http://southasia.foreignpolicy.com/posts/2012/02/01/afghanistans_injustice_system#sthash.ZMNIXgMX.dpbs (accessed December 15, 2013). Hayes, Richard E., Stacey R. Kaminski, and Steven M. Beres. “Negotiating the Non-Negotiable: Dealing with Absolutist Terrorists.” International Negotiation 8, 2003: 451-467. Hyde-Price, Adrian. “Redefining its security role - Germany.” In Global Responses to Terrorism - 9/11, Afghanistan and Beyond, edited by Mary Buckley and Rick Fawn, 101-112. London: Routledge, 2003.
International Crisis Group. “Talking About Talks: Toward a Political Settlement in Afghanistan.” Asia Report N° 221. 26 March 2012. http://www.crisisgroup.org/~/media/Files/asia/south-asia/afghanistan/221-talking-about-talks-toward-a-political-settlement-in-afghanistan.pdf (accessed November 15, 2013). —. “Women and Conflict in Afghanistan.” Asia Report N° 252. 14 October 2013. http://www.crisisgroup.org/~/media/Files/asia/south-asia/afghanistan/252-women-and-conflict-in-afghanistan.pdf (accessed November 15, 2013). Khan, Tahir. The Express Tribune with the International New York Times. 2 November 2013. http://tribune.com.pk/story/626006/talking-terms-qatar-talks-get-another-chance-after-deadlock/ (accessed December 15, 2013). Lederach, J.-P. “Der Beitrag Dritter beim Aufbau des Friedens. Eine Perspektive des “Friedens von unten.”” In Die Wahrheit einer Absicht ist Zitat. Friedensfachdienste für den Süden und den Norden, edited by Josef Freise and Eckehardt Fricke. Idstein: Eirene International, 1997. Maslow, Abraham. “A Theory of Human Motivation.” Psychological Review, 1943 (50): 370-396. Metzger, Tobias. “Caught Between 'Deradicalization' and 'Disengagement': Clarifying Terms in the Discourse of Terrorism.” Student Pulse 5, no. 11 2013: 1-4. National Geographic. “Afghan Heroin - The Lost War.” Youtube. 2008. http://www.youtube.com/watch?v=obhwoSameHg (accessed December 26, 2013). Osman, Borhan. “Déjà Vu All Over Again: The Af-Pak roller coaster and a possible new Taleban office .” Afghanistan Analysts Network. 25 August 2013. http://www.afghanistan-analysts.org/deja-vu-all-over-again-the-af-pak-rollercoaster-and-a-possible-new-taleban-office (accessed December 10, 2013). Osman, Borhan, and Kate Clark. “Who Played Havoc with the Qatar Talks? Five possible scenarios to explain the mess.” Afghanistan Analysts Network. 9 July 2013. http://www.afghanistan-analysts.org/who-played-havoc-with-the-qatar-talks-five-possible-scenarios-to-explain-the-mess (accessed December 10, 2013). Pakistan Ministry of Foreign Affairs. Latest Press Releases/Speeches. 20 September 2013. http://www.mofa.gov.pk/pr-details.php?prID=1441 (accessed November 14, 2013). Rashid, Ahmed. Descent into Chaos: The world's most unstable region and the threat to global security. London: Penguin Books, 2009. —. Pakistan on the Brink: The future of Pakistan, Afghanistan and the West. London: Penguin Books, 2012. —. Taliban - The Story of the Afghan Warlords. London: Pan Books, 2001. Röminger, Jannika. Masterarbeit - Der Zivile Friedensdienst in Afghanistan – Erfahrungen und Erkenntnisse ehemaliger Friedensfachkräfte. Bonn: Philipps-Universität Marburg, 2011. Rondeaux, Candace. “Reconsidering Reconcilitation in Afghanistan.” Foreign Policy. 3 October 2011. http://southasia.foreignpolicy.com/posts/2011/09/21/reconsidering_reconciliation_in_afghanistan (accessed November 10, 2013). —. “The WikiLeaks: An Afghan View.” International Crisis Group. 28 July 2010. http://www.crisisgroup.org/en/multimedia/podcasts/the-wikileaks-an-afghan-view.aspx?alt_lang=es (accessed December 15, 2013). Rose, Charlie. Always a Reckoning: The Charlie Rose Show. Transcript no. 1293, broadcast by PBS, 17 January 1995. Ruttig, Thomas. “Flash to the Past: When the Taleban wanted UN-monitored elections .” Afghanistan Analysts Network. 25 June 2013. http://www.afghanistan-analysts.org/flash-to-the-past-when-the-taleban-wanted-un-monitored-elections (accessed November 30, 2013). Sandole , Dennis J.D. A Comprehensive Mapping of Conflict and Conflict Resolution: A Three Pillar Approach. 1998. http://www.gmu.edu/programs/icar/pcs/sandole.htm (accessed December 22, 2013). Sedra, Mark. “Challenging the Warlord Culture: Security Sector Reform in Post-Taliban Afghanistan.” BICC - Bonn International Center for Conversion. October 2002. http://www.bicc.de/publications/publicationpage/publication/challenging-the-warlord-culture-security-sector-reform-in-post-taliban-afghanistan-190/ (accessed November 29, 2013). Spector, Bertram I. “Negotiating with Villains Revisited: Research Note.” International Negotiation 8, 2003: 613-621. U.S. Department of Homeland Security. National Consortium for the Study of Terrorism and Responses to Terrorism (START). 2013. http://www.start.umd.edu/start/data_collections/tops/terrorist_organization_profile.asp?id=4279 (accessed November 25, 2013). UN. 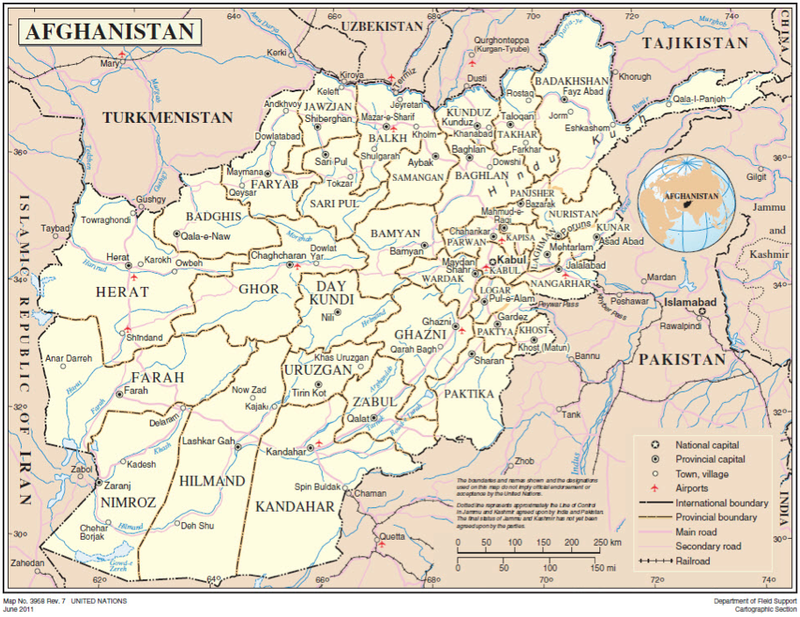 “Map of Afghanistan.” UN Cartographic Dept. June 2011. http://www.un.org/Depts/Cartographic/map/profile/afghanis.pdf (accessed November 24, 2013). United States Institute of Peace. Certificate Course in Conflict Analysis. 2004. http://online.usip.org/analysis/5_1_1.php (accessed December 10, 2013). Wilmot, William W., and Joyce L. Hocker. Interpersonal Conflict. 6th ed. New York, NY: McGraw-Hill, 2001. Yabi, Gilles. “The Role of ECOWAS in Managing Political Crisis and Conflict.” Friedrich Ebert Stiftung. September 2010. http://library.fes.de/pdf-files/bueros/nigeria/07448.pdf (accessed August 20, 2013). Zartman, William I. “Negotiating with Terrorists.” International Negotiation 8, 2003: 443-450. —. “The Timing of Peace Initiatives: Hurting Stalemates and Ripe Moments.” The Global Review of Ethnopolitics, September, Vol. 1, No. 1 2001: 8-18. 4.) Terrorism is defined by the UN Security Council “as violent or criminal acts designed to create a state of terror in the general public” (UNSCr 1373) and by the U.S. Government “as premeditated, politically motivated violence perpetrated against noncombatant targets by subnational groups or clandestine agents, usually intended to influence an audience.” (Department of State, 2002) as quoted in (Zartman 2003, 444). 25.) Cf. (International Crisis Group 2012, 3, 16): ICG instead envisions the UN to be in the lead of a broad-scale mediation process. 33.) The Institute for Conflict Analysis and Resolution is a department of the George Mason University outside of Washington D.C.: www.gmu.edu/departments/icar. 37.) See section 2.6 and Appendix D for further details. 39.) Cf. (Rashid 2001, 74): The Taliban killed an estimated 5,000 to 6,000 according to the UN after taking Mazar in ‘98. 41.) Cf. (Rashid 2001, 18). The U.S. is said to have channelled $4-5 billion to the mujahidin between 1980 and 1992 with Saudi Arabia matching all funds leading to over $10 billion in military assistance. 44.) Please consult Appendix A for a map of Afghanistan. 52.) Cf. (Bright n.d., 3): 1) Individual, 2) Societal, 3) International, 4) Global/environmental level. The fourth level is excluded from the analysis since none of the actors position themselves towards ecological, but rather social, political and economic, issues. 54.) Cf. (Rashid 2009, 133): Human Rights Watch coined the term “U.S. warlord strategy” used to “be relieved of Afghanistan's security and political and human rights responsibilities". Senator Joe Biden acknowledged this in a 2002 speech, cf. Full text of Biden's speech reported in "Biden Promises $130 Million for Security in Afghanistan"
68.) Cf. (AlJazeera, Further delays for US deal with Afghanistan 2013) which quotes National Security Advisor Susan Rice as saying: "Without a prompt signature, the US would have no choice but to initiate planning for a post-2014 future in which there would be no US or NATO troop presence in Afghanistan". 79.) Cf. (Sedra 2002, 30, 33, 87): Defence Minister Fahim drafted 90 out of 100 generals from Panjshiri Tajiks and citizens from Taliban-dominated areas are almost entirely unrepresented in the military and police (while constituting 17% of the population only 1.5% of soldiers since 2009 are from these areas). 89.) For a discussion of ‘terrorist’ categories including ‘absolute’ (‘revolutionary’ and ‘conditional’), ‘contingent’ (e.g. barricaders, kidnappers or hijackers) and ‘social revolutionary or religious terrorists’, please refer to: (Hayes, Kaminski and Beres 2003), (Donohue and Taylor 2003),(Spector 2003) or (Zartman 2003, 445-447). 93.) Cf. (U.S. Department of Homeland Security 2013): Only the Pakistani Tehrik-e-Taliban (TTP) is included. 113.) Cf. (Berghof Foundation 2012, 2-3): The Berghof Foundation calls for actors to pay specific attention to three dimensions “in contexts of polarised societies ... emerging from, protracted violent conflicts”: 1) inclusivity of all conflict stakeholders with the capacity to promote or impede constructive social change, 2) participation on ‘how to engage’ these stakeholders, 3) comprehensiveness (e.g. embedding DDR and SSR approaches in their economic, political and social context). 119.) Cf. (Brinkmann 2006, 61): Influence can be exercised by reframing and repeating the parties’ common positions or by asking them to express their own feelings and possible feelings of the other party. 120.) For a thorough analysis of women rights during the Taliban reign and in post-Taliban Afghanistan, please refer to (International Crisis Group, Women and Conflict in Afghanistan 2013). 121.) Cf. (AFP 2013): In 2013 alone, more than 30 employees were killed across Afghanistan making it the deadliest year for aid workers. 123.) Cf. (BBC Productions 2011): Osama bin Laden’s son stated that it was his father’s dream for the U.S. to invade Afghanistan and be defeated by guerrilla fighting as a consequence of 9/11, which is why an al-Qaeda suicide bomber killed Ahmad Shah Massoud, leader of the Northern Alliance, one day prior.